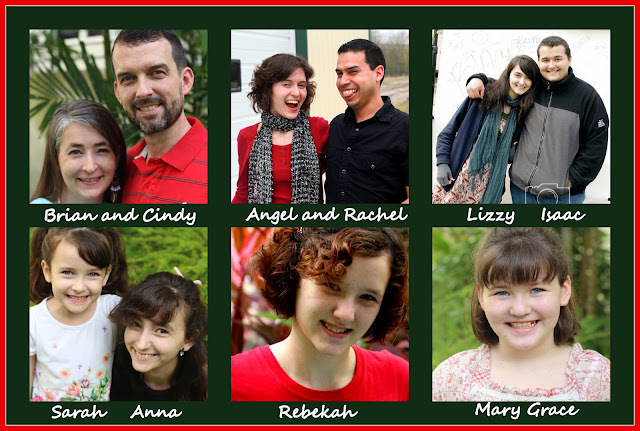 Angel and I make handmade Christmas cards every year, rather than opting for store bought or picture cards. I don't do store bought cards because making Christmas cards is such a good excuse for spending money on paper-crafting supplies! And we don't do picture cards because, for me, I feel like sending out family pictures every year makes a lot more sense when you actually have kids. Besides, I have approximately 735 pictures of Angel and I on here, so whenever my friends and family forget what we look like, they can just visit www.therandomwritings.com. They don't need a picture Christmas card from us. This is our card. My main goal in coming up with the card design was that I wanted a piece to be cut out of the front to show the back of the card. Obviously, because I wanted to use one of those really cool precise craft knives. Cutting squares out of the middle of my cards was just as fun as I thought it would be! And this is the card design I made for my parents. I saw a similarly designed Christmas tree somewhere and I thought it would work well for mass-produced crafting. These cards were made with love by Angel and Rachel on our coffee table while watching movies borrowed from the library. And here's the family picture for my parents' Christmas card, designed by Lizzy. We had to do it Brady Bunch style, because photoshopping everyone into the same picture would just have been way too complicated. Don't I come from a good looking family?? And isn't it so incredibly Angel-ish that he's sticking his tongue out on the family picture? If you have a minute, you should check out Carolynn's Etsy giveaway--open worldwide, and there will be 5 winners, so the odds are high you could win something! Also, for us old married folks, remember how exciting it is when you get your very first peek at your wedding photos? The very first pictures from Carolynn's wedding were just posted, so check them out! I like the tree card you made. I made cards, too. I also did get two of those photo cards with a pic of my husband and I on them.